As soon as you step foot onto campus, you can spot them on any corner. 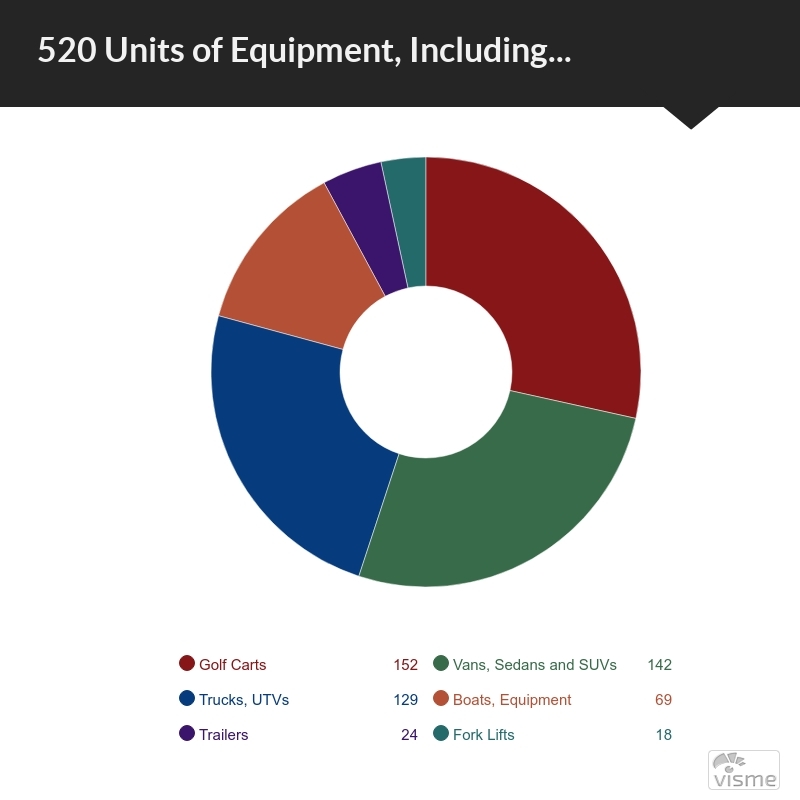 Five-hundred and twenty units of equipment, including 58 unique types of vehicles such as vans, trailers, trucks and even airboats. They are the golf carts, police vehicles and life-saving Panther Mover serving students and faculty. FIU’s fleet is an integral part of its everyday operations. But the trustworthy fleet is exemplary not only within the university but the continent as well, ranking 66th out of the 100 Best Fleets in North America, and second among universities, according to its results. Thirty-eight thousand public fleets were ranked based on their on their creativity, accountability and resourcefulness, among other criteria. Last year, FIU’s fleet ranked at No. 82. “And next year we’ll do better,” says Carlos Berriz, the fleet’s manager. The team behind the fleet prides itself on its reliability and innovation. They know students and faculty across campuses rely on their services and want to serve them beyond what is expected of them. The team includes Berriz, Martinez, Nancy Cadavid, director of the office of Business Services and Rodolfo “Rudy” Vila, assistant vice president of Business and Finance. “We were very happy last year to even place,” says Cadavid. Previously known as vehicle services, the fleet was reestablished in April 2016. The program commits itself to provide first-class services to the FIU community. They do this by securing and maintaining their vehicles, as well as establishing trust with the other departments on campus reliant on the fleet, such as Public Safety, Facilities Management, Campus Grounds/Maintenance, Athletics and Parking & Transportation. “The fact that we made it so high and were one of the few universities there, it’s a huge attribute towards FIU and our fleet management,” she added. Pedraza praised the team behind the fleet for their commitment to safety and maintenance. “They do an amazing job of providing their service so that our operations run smoothly and continue. That comes from the insight of a good fleet management,” she said. The Panther Mover provides transportation to approximately 2,500 passengers a year. Captain Alberto Alberto Jr., of FIU Police relies on the fleet’s police cars for his team’s essential procedures. “Behind the scenes, nobody really ever sees that. When the police respond, they’re the ones out there, but it is with a vehicle that we procured, fixed and maintained for them,” said Berriz. Creativity is one of the main factors the fleet was judged upon. Lube @ FIU provides affordable oil and filter changes to students and staff, as well as complimentary shuttle services to their vehicles before and after maintenance has been completed. These services are unique to the fleet and to universities in general. Lube @ FIU performs an average of three-hundred and eighty oil and filter changes a year. “We’re a little city so we need to provide to all of our constituents,” said Aime Martinez. When it comes to environmental stewardship and energy efficiency, the team is committed to reducing and avoiding waste. “We are very conscious – we make sure all the oil, antifreeze and scrap metal is recycled, the tires and filters are properly disposed of,” said Berriz. In the face of emergencies and catastrophes, they go beyond in their preparedness, delivering optimal services amid turmoil. “As soon as they say ‘there is a hurricane coming’ we have to make sure to fill the tanks and make sure we are available,” said Martinez, in reference to last year’s Hurricane Irma. This year’s bridge collapse accident was also a moment in which they had to respond immediately. “The fleet was highly relied upon to transport students and the families of the victims away from the accident,” said Pedraza. Their future projects, which they hope will help them improve upon their rank for next year’s award, include rebranding the look of the fleet, researching and implementing GPS technology, switching the Panther Mover vehicles from conventionally powered to electrically powered, and expanding upon Lube @ FIU’s services to students and faculty. This desire to expand Lube @ FIU’s services arose from feedback and surveys from students and faculty. “We do listen to the students and have surveys to know what we can improve on,” said Rudy Vila. “We are working on an expansion. How it’s going to look like, we don’t know yet. We are in the early stages,” added Berriz. Despite the fleet’s ubiquity, the team is aware of how obscured their work may be. Still, they embrace this inevitable aspect of their work and this award is proof that their efforts are admired nationwide and integral to the university. “It’s kind of like when you hit a switch, you expect the light to always turn on, but you don’t really know what goes on behind the scenes to make sure that electricity is always being generated,” said Berriz, lightheartedly. Lube @ FIU is located at W-2 in MMC and SO-3 in BBC.